Hello Thursday! We’re 9 days away from our Spring show, and believe us when we say this weather has us dreaming of warm sun on our skin and summertime travels! Day trips, road trips, Island pilgrimages (Hello Tofino! )… sometimes we just need a capsule wardrobe so we can throw together a bag and hit the road at a moment’s notice. That said, we demand a bit more from our clothes now: they must be fashionable, but also take as little from the planet as possible… thank goodness for Harly Jae! In a mix and match neutral colour palette, we could easily see all the sights and never wear the same outfit twice on a trip. Vancouver made Harly Jae joins us for the first time this spring, but having stalked the line via Instagram for so long, it feels like we’re old friends. We had a chance to chat with designer Laila Potvin about the who, the what, and most importantly, the wear of slow fashion…. Enjoy! J’aime Pierrot! We are introducing a new color to our Pierrot jacket & pant collection: a dreamy off-white. This clean cream enlightens the wearer. These items are made sustainably & ethically making them investment pieces price-wise, but they are true champions when you look at them from a cost per wear perspective. The jacket & pants are timeless pieces, made of our beloved hemp & cotton blend, which you will find yourself wearing for all seasons and occasions. 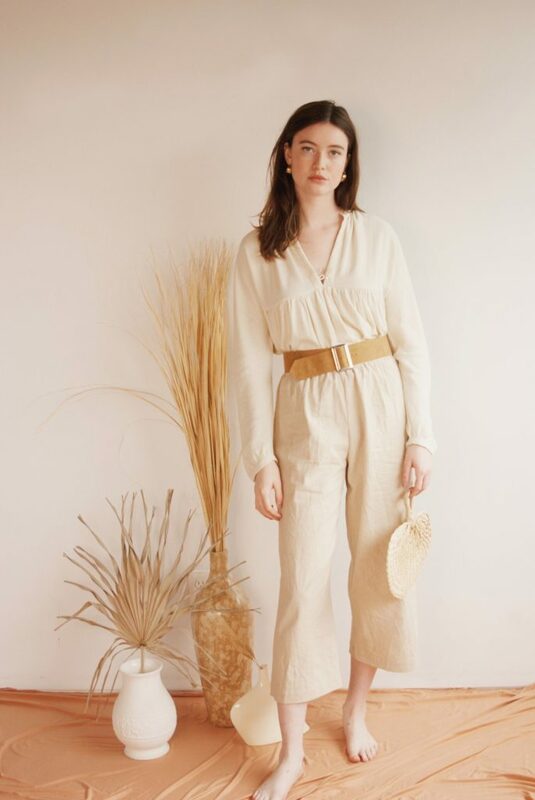 First Pick was mentioned as the Georgia Straight “best market for Sustainable Style” right after our Fall 2018 Show… What do you offer that is sustainable/green/ethical that customers won’t want to miss for Spring? We are happy to say that everything Harly Jae is made of eco-friendly fabrics on top of being ethically made right here in beautiful BC. This even includes our hang tags which are made from organic cotton. We use EcoEnclose packaging for all shipping material and print promotional materials on eco-friendly paper. When did you start you line? How has your line evolved since then? Harly Jae was launched in June of 2017 and ran as a solo mission until just recently. We are now a team of two! We are gleefully watching as the brand naturally matures with our customers, nurturing this rooted growth. We continue to evolve in terms of our designs, our fabrics and our sustainability. For the future, we hope to expand upon the ways that we can both inspire and be inspired by our community. Harly Jae designs vintage-feminine inspired garments that are versatile & functional. Our design process is intentionally focused on creating pieces that are timeless both in design and quality, giving our customers pieces that can be worn for years to come. We design and manufacture each piece ethically in Vancouver, using sustainable fabrics. These aspects of our business allow us for greater quality control and a much smaller impact on dear mother earth. Our customer is the Canadian woman. She values sustainable fabrics but doesn’t want them to be see-through, or lacking in design, quality or fit. When she dresses herself, she wants to feel beautiful and also know that she is making a difference. She might even consider herself to be a part of the slow fashion movement. She loves designs that are timeless, pulling together her favourite elements of vintage & classic designs. Sometimes it feels like there’s an expectation to be a “big business” when in fact we are one person shows… how do you manage/stay sane/get it all done? I now have a partner that compliments my strengths & weaknesses, allowing us to accomplish more together. We stay true to our mission as a slow fashion label, remembering to take things slow when we can. Embracing the journey and being curious. It is such a dream to be doing this as my job that I try to remind myself to always take it one day at a time, knowing and trusting that I will always be guided and supported.